The cucumber is an easy-to-grow and much-loved summer vegetable. It prefers warm temperatures, needs plenty of room to grow and can be grown in small garden spaces when trellised. Cucumbers are used fresh in salads, eaten plain and often pickled. With so many varieties, it may be surprising to learn that the life cycle of all cucumbers is remarkably similar. 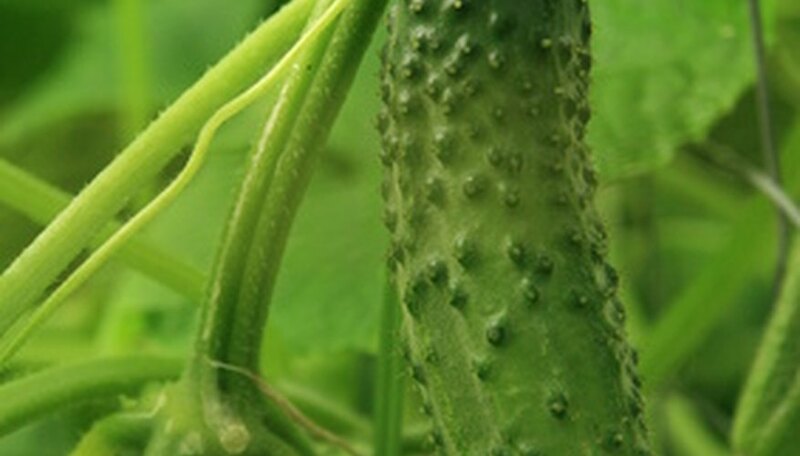 Like many vegetables, cucumbers carry their seeds inside the vegetable itself. Seeds can be removed from the cucumbers and saved for the next year as long as they go through stratification. Stratification is the process whereby the seeds are subjected to cold temperatures for weeks as they would be in nature during winter. Once they have completed this process, they can be planted the following spring after the danger of frost is over. Seeds are viable for several years. If seedlings were started indoors, they can be transferred outside when they are 3 to 4 weeks old and after the last frost date has passed. Whether thinning outdoor-grown plants or transplanting indoor starts, the seedlings do best when spaced 1 to 2 feet apart with rows spaced approximately 5 feet apart. As they grow, blossoms will begin to form. Cucumbers have both male and female blossoms on each plant. Female blossoms have what resembles a tiny cucumber just below the flower; these are what develop into cucumbers. Cucumber plants are vines that sprawl and roam as they grow. Vines left to grow this way will develop cucumbers that lie on the ground. As long as the ground does not puddle during rain or watering, this should not impede growth. In damp, poorly drained areas or small gardens, trellises can be added to support the vines and the weight of the cucumbers. Because of the different types of cucumbers, their harvest time varies. Pickling types begin to be ready for harvest about 48 days after planting. Slicing varieties take 60 to 70 days before harvesting can begin. Both will continue to produce throughout the warm growing season. Cucumbers grow rapidly and should be checked daily for harvest. Left too long, the cucumber can become too large and overripe, which makes it full of seeds and not as tasty. Overripe cucumbers, while they don't taste very good, are perfect for seed harvesting. Because of their size, they have more seeds than smaller cucumbers. Left to nature, they would fall to the ground and decompose, letting their seeds become part of the landscape or be eaten by animals and have their seeds distributed to other areas when they pass through the animals' digestive system. For collection purposes, remove the seeds from the cucumber and allow them to air dry. Store the seeds in a cool, dry place like the refrigerator and you will have seeds for next year’s planting.